With zero carbon emissions, the biomethane-powered bus is a viable alternative for Ireland’s public bus fleet, and the biogas bus has been part of national trials looking at green bus performance, air quality impacts and CO2 emissions, among other criteria. Biomethane is a clean, renewable gas that is 98% methane. Also known as green gas, it can be used interchangeably with conventional fossil-fuel natural gas, meaning it can be added to the existing gas grid. The majority of European capital cities now run their buses on gas, resulting in lower carbon emissions and better air quality in cities. “Energy Cork has been advocating the benefits of adopting compressed natural gas and biomethane for our public bus fleet in Cork for a number of years, so we are delighted to be making a journey today on Ireland’s first zero carbon emissions bus. Never has the demand for public transport been greater in Cork with the city centre expecting an additional 10,000 jobs in the next 5 years. We have the opportunity now to shape how we grow and be proactive in adopting technologies that work for the City and which protect our environment and air quality. This technology is tried and tested with examples of biomethane bus fleets in Stockholm, Lille and Nottingham to name just a few cities. 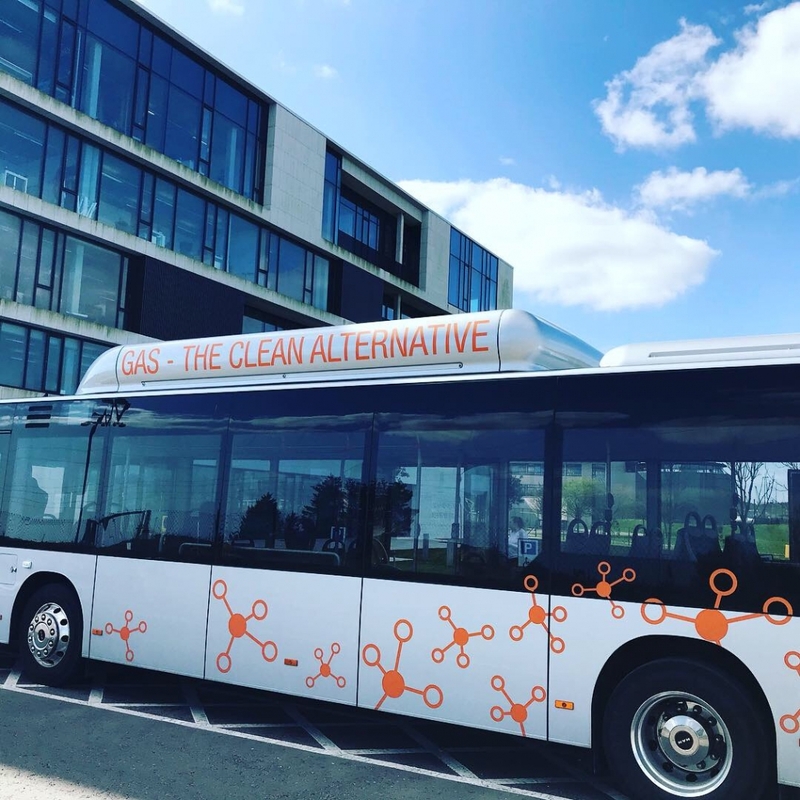 We are very keen to see this technology supported by the National Transport Authority and hope to see these buses rolled out in Cork in the not too distant future,” said Michelle O’Sullivan, Energy Cork spokesperson and Cork Chamber Public Affairs Senior Executive. Faced with EU deadlines to reduce harmful greenhouse gases, and following Budget 2018, Ireland will no longer be able to purchase diesel buses for public transport as of 1st July 2019. The Department of Transport, Tourism & Sport has been carrying out technology trials of hybrid diesel, fully electric, electric hybrid, compressed natural gas (CNG) and biomethane powered buses in Cork and Dublin in recent months to review performance. The green buses have been travelling key routes in the urban bus transport network, but have been weighted rather than carrying passengers so today represents a landmark in Ireland’s move to a greener public transport system. The first passenger bus journey of its kind in Ireland will pick up from Lapps Quay in Cork city and travel to the SFI funded Centre for Marine and Renewable Energy (MaREI) in Ringaskiddy where passengers will have the opportunity to gain insights from leading gas and algal biofuels researcher Professor Jerry D. Murphy on the research and focus of the work ongoing. Energy Cork, which brings together Cork City Council, Cork County Council, Gas Networks Ireland, Bus Eireann, Cork Chamber and other regional stakeholders, has been working closely to garner support for green bus routes throughout the city and county. Following the success of Drive4Zero, which incentivised Cork commuters to switch to electric cars, Energy Cork believes that green buses are vital to the sustainable infrastructure and development of Cork in the future. Biomethane is a naturally occurring renewable gas produced by the anaerobic digestion of organic materials and residues from agriculture, food production and waste processing. It can be produced biomethane from slurry, sewage, red meat processing waste, residues from breweries and distilleries, food waste, and farm manure. Biomethane not only generates energy, but also supports a more circular economy through the use of waste as a resource.